It is a common interview question in any interview like Information Technology, Banking, Insurance, Telecom industries etc..
ii) HR / General Interview Questions. 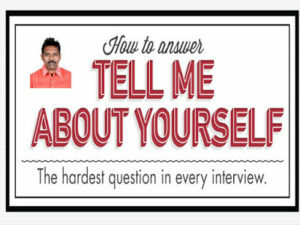 This “Tell Me About Yourself is not a Subject related question, It is general question, or HR Interview question. > Tell me about yourself? > Tell us a little about yourself? > Tell something about yourself? > Say something about yourself? > Describe yourself in three to five words? > What would you like me to know about you? But what are they really asking? It is suggested to answer this question in 5 to 6 sentences, not in too detail, Start with your name, place of stay, next your highest educational qualification, and forth would be summary of your skills and experience, and fifth would be your important qualities that are relevant to the Job. My name is Gedi Chandra Mohan Reddy, I stay in Hyderabad, I have completed my Bachelors in Engineering with specialization in Information technology, Overall I have 5 years of experience as a Software Tester, conducted Manual testing, as well as Automated Testing using UFT, and Selenium also, and I have little bit experience in Mobile Testing. 2) Tell me about Your current Project? Tags: Common Interview QuestionsDescribe yourself in three to five words?HR Interview questionsTell Me About Yourself?Tell something about yourself?